You've shelled out for the best web design company you could afford. You've paid big bucks to the SEO company to shoot you up the rankings. But if your site's designed to make you money—through product sales or advertisements—there's one more thing you must do: optimize it with split-testing. Most people set their sites up in an arbitrary way on the basis of what looks nice or "seems to work." But as web pros know only too well, even apparently insignificant changes to your site's structure, layout, colors, or type can bring big payoffs in click-throughs and orders. Split-testing (sometimes called A/B testing) is a simple way of optimizing your website by comparing the results you get with two different versions of the same page. Let's take a closer look! Photo: Split-testing web pages is the best way to determine which of various different site layouts gives you the results you want—in sales or advertising revenue. 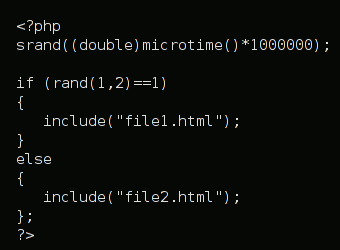 All you need to master is a tiny bit of PHP, like this. The simplest way to test the effectiveness of a web page is to alter your current design, try the new design, and compare the results. Sounds simple—and it is. The only trouble is, it's too simple. If you run design A for a whole week and then run design B for the whole of the next week and compare the results, you won't necessarily establish which design is the best. If you're tuned in to how your web traffic fluctuates from day to day and week to week, you'll know only too well that many things can change from one week to the next. You might hit a school holiday, for example, or a run of really good weather that sees large numbers of people quitting their desks for the beach. Similarly, if you're trying to compare advertising performance, you probably know that many factors can change week by week, day by day, and even hour by hour. There may be more people advertising in the second week than the first, producing a bigger advertising inventory, higher paying ads, and better results—irrespective of which design is running on your site. Someone might flag your site with a social bookmark or mention you on a forum, sending you a sudden, massive batch of very dubious quality traffic that dramatically reduces your site's performance. All told, running one design for a day, week, or month before alternating with another design is going to give only a crude idea of what works best. You could keep switching back and forth between different designs and use some form of graphical or statistical analysis package to compare your results each time you switch but, the trouble is, it's going to cost you money to do this! One of your designs is almost certainly a bit better than the other. If you change your original layout for the worse, every day you run a less-effective, alternate design is a day that dips into your dollars. That's why you need split-testing. Split testing dates back to early "key-code" tests of newspaper advertising devised by Claude Hopkins about 100 years ago. He printed slightly different versions of an advertisement (perhaps one with one headline, one with another), including a coupon with a return address that featured a different mailing box number. By comparing the number of people who replied to reach coupon, he could reliably measure the effectiveness of each ad variant. Testing multiple variants over days or weeks, he would eventually arrive at an optimized ad. Today's split testing of online ads is just an updated, hi-tech version of the Hopkins method. The method is simple. You create two different versions of a web page and arrange for them to be shown randomly, alternately, to your visitors. You track the performance of each page separately and compare your results from each page after a decent number of impressions (a few thousand is usually enough but a big difference in performance will show up after only a few hundred). PHP, if you don't already know, is a superb program that runs at the web server end of things, building web pages on the fly before they're sent out to a browser. It's immensely powerful and you can spend ages learning how to do all kinds of neat things with it. But, even if you have no experience of using PHP, you can learn just enough to run simple web page tests in about five minutes. Here's how! You'll be comparing a new version of your web page against your original and possibly modifying the original quite a bit, so do the sensible thing and make a backup of the original to start with. Now alter your page to create the new, "improved" version you want to test. Maybe you want to test a different ad layout, change the colors, use a different style sheet, rewrite some wording, place a big "Place your order now" button at the very top, or whatever. You can compare versions that are as different as you like, but ideally you want to change only one thing at a time so you can be sure which change made the difference. So maybe change the colors first and test those. Then, when you've found the best color scheme, change the layout. Then change the wording. Then add your "order now button." And so on. Make each change and evaluate it separately before monkeying with anything else. If you change everything all at once, you won't know where you are: you won't know what improved or impaired the response to your page. In this simple example, you could monitor effectiveness simply by seeing how many orders you get through the page ordertest.html compared to your usual ordering page. You could see how many times each page is loaded and how many orders you get as a result. If you want to compare the performance of two different advertisements, you can put one lump of advertising code in file1, another lump in file 2, and set up different channels/counters to monitor the CTR from each. Now all you have to do is wait for the results to come in. There are still some things to be wary of. The first is that if there is no real difference between the two pages you're testing, any counters or measurements you set up will likely flip back and forth showing first one page in the lead and then the second page, with the position constantly alternating. If that happens, it usually means the pages are just as good as each other, even if one page ultimately gets slightly better results than the other. If one page is constantly ahead of the other page throughout your test, it's obviously a better page. But do be sure to allow enough page impressions to give a reliable result (certainly a few hundred and maybe a few thousand, if you have time). Don't be tempted to draw conclusions from only a few impressions. If you want to be really certain (and scientific), run a chi-square test and check for statistical significance. Once you've established one change that works, go back and incorporate it into your entire site and monitor the results. Then work on identifying another change and see if you can improve things a bit more. Keep doing this and, over time, you should systematically and significantly improve your site's performance. Every so often, run a test where you compare your current version of the site with an earlier incarnation to reassure yourself that the cumulative changes you've made are all working to your advantage. That's just a little double-check for your own peace of mind! Google Web Fundamentals: Performance: A great collection of optimization tips and techniques from Google's own software engineers. Even Faster Web Sites: Performance Best Practices for Web Developers by Steve Souders. O'Reilly, 2009 and the earlier companion volume High Performance Web Sites: Essential Knowledge for Front-End Engineers by Steve Souders. O'Reilly, 2007. The A/B Test Results Are In by Michael V. Copeland. Wired, May 9, 2012. An example of the sorts of things you can try with A/B testing and the sorts of results you might get.